Full 90° opening for outswinging doors. For lightweight screen doors, wood or metal. Adjustable closing speed control valve. Two-hole end plug for summer or winter. Adjustable latching power. 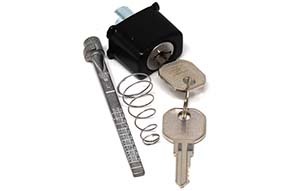 For storm door locks. Fits most rectangular push button storm doors. Furnished with calibrated metal spindle and spring. Includes handle & closure kit. For all mobile home, screen, storm, and combination doors. 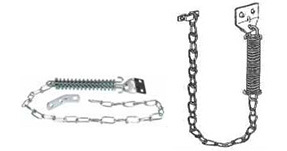 Heavy tension spring, link chain. Installs securely with heavy duty bracket & long screws. Keeps door closed and secure during transport or whenever you need to restrict access.